Makes me wonder how much far-reaching that is into the future. That looks like what is currently available, except for the 150-400. There is an orange marker, with angled ends, for the 150-400, and the others, with fading ends, just indicate the lens ranges, the way I see it / read it. The only future lens indicated is the 150-400, but usaing almost the same colour for the lens ranges makes it rather confusing indeed . BC, you forgot to log out and then log in. Speaking of the roadmap... looks like the 17-25-45 prime lineup is going to be filled out with something wider and longer. 12/1.2 and 60/1.4? Who knows. 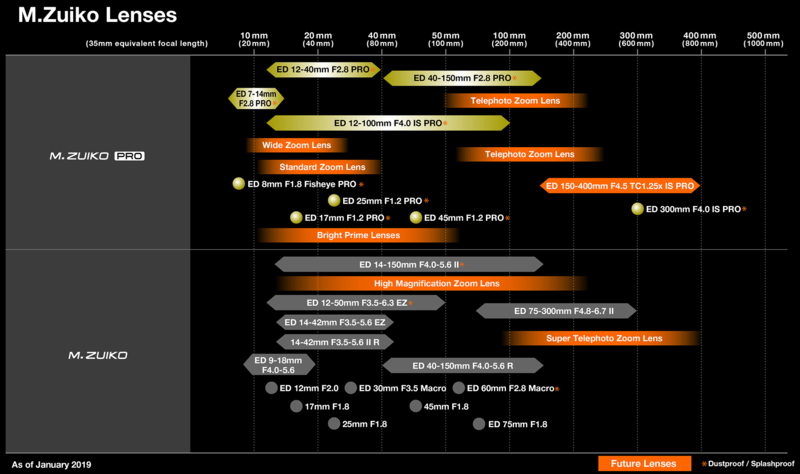 What else - a 3x zoom starting at 9mm, may be pretty cool (a competitor to Panasonic's 10-25/1.7?) A duo of tele zooms between 50-210ish and 100-400ish, well, these may be the other reactive entries, this time to the Panasonic/Leica 50-200 and 100-400. Well... nothing terribly inspiring apart from maybe something in the "Bright prime lenses" category. f1.2 on MFT is not that bright... It is equivalent (I know you have an odd dislike of hat word, Rover) to an f1.8 lens on your 1.3x crop camera. Not thaaat bright, right? Equivalent to f2.4 on FF. BTW I'm also using a 1.6x APS-C camera now. If you feel compelled to make cross-format comparisons all the time, then for the sake of completeness you must also include that one when talking to me. (01-27-2019, 10:05 AM)Brightcolours Wrote: f1.2 on MFT is not that bright... It is equivalent (I know you have an odd dislike of hat word, Rover) to an f1.8 lens on your 1.3x crop camera. Not thaaat bright, right? Equivalent to f2.4 on FF. Now you are wrong, F/1.2 is F/1.2, just as bright as any other F/1.2 lens. Brightness has nothing to do with equivalence. Equivalence is purely caused by sensor size, and implicitly, sensel size. Whether an F/1.2 lens is equivalent DoF-wise to F/2.4 in a system with another sensor size, has nothing to do with brightness, as the latter is measured in the amount of light per area unit, which is the same at the same aperture for any sensor size, for any photographic medium for that matter. Oh well, here we go again.